3 DIFFERENT TWEEZERS: Slant, flat and pointed eyebrow tweezers provide different degrees of trim to meet your multiple needs. Perfect for eyebrow shaping, ingrown hair and nasal hair trimming. SUPERIOR STAINLESS STEEL: The tweezer kit is made of 100% high quality stainless steel, which is rust-free, hard to break and more durable to use. Smooth surface ensures comfortable to hold. SAFE & CRAFTED TIPS: The tip of each tool can accurately remove the excess hair on your face. No harm to your skins and no allergenic. Effortlessly pluck and shape eyebrow due to better calibrated tension. 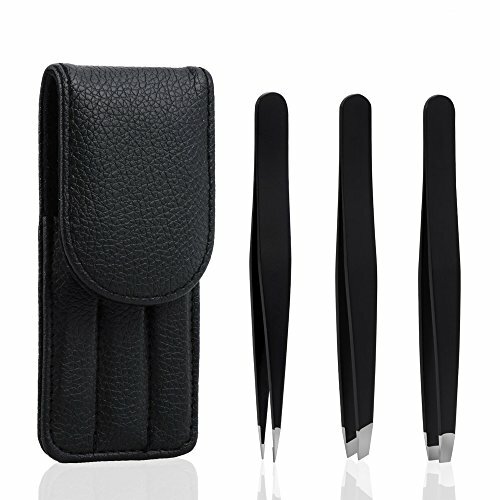 LUXURY TRAVEL CASE: Come with a leather travel case to store tweezers. Conveniently put tweezers in your handbags or pockets. Easily find them and do your daily beauty routine anytime and anywhere. SATISFYING WARRANTY POPICY: One year warranty for a new replacement or refund provided. Please feel free to contact us when you do not satisfy with our products or meet some knotty problems. Great Quality, Very Sharp Tweezers Set!! !